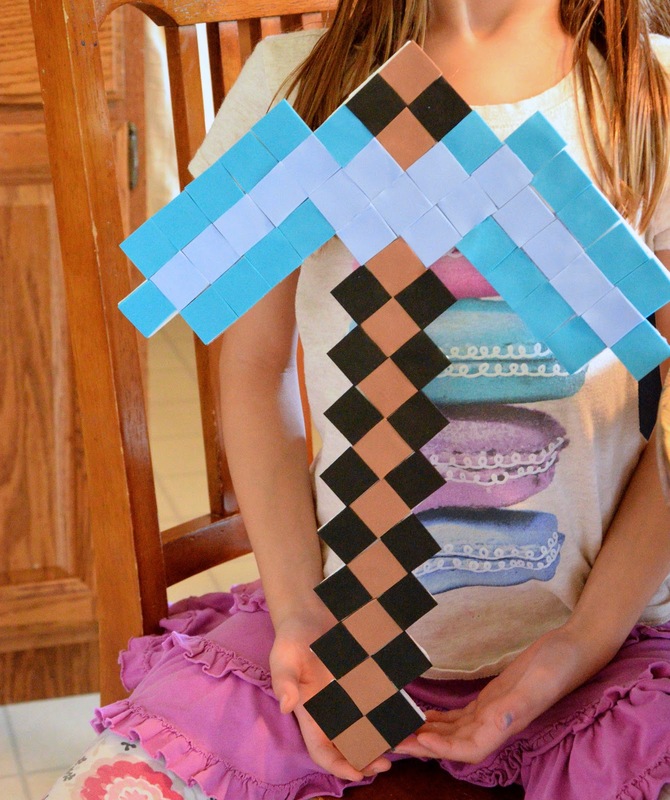 Here is how we made those pickaxes for Kate's Minecraft party. 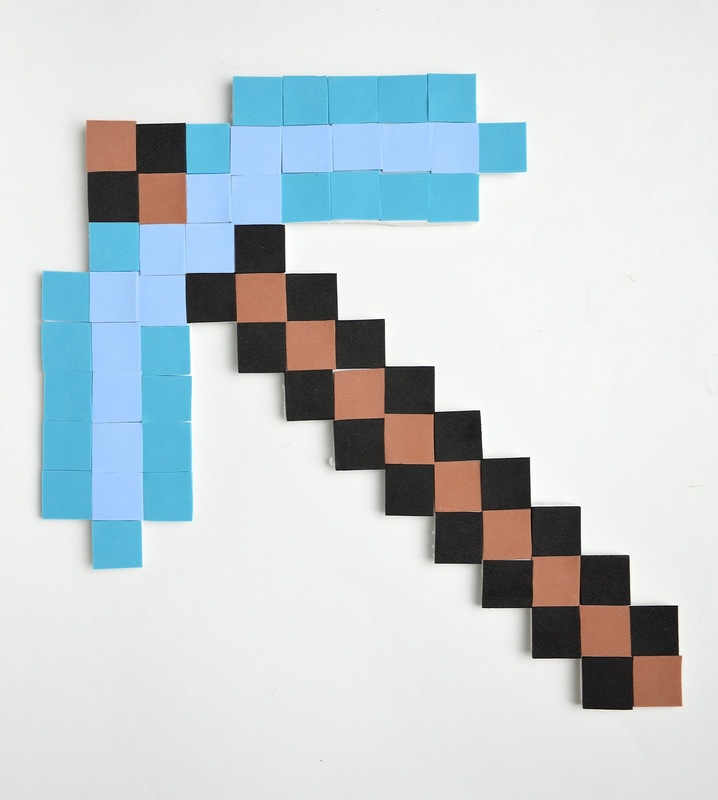 It was a toss-up between the sword and the pickaxe - while the sword was more iconic, I thought (but what do I know?) 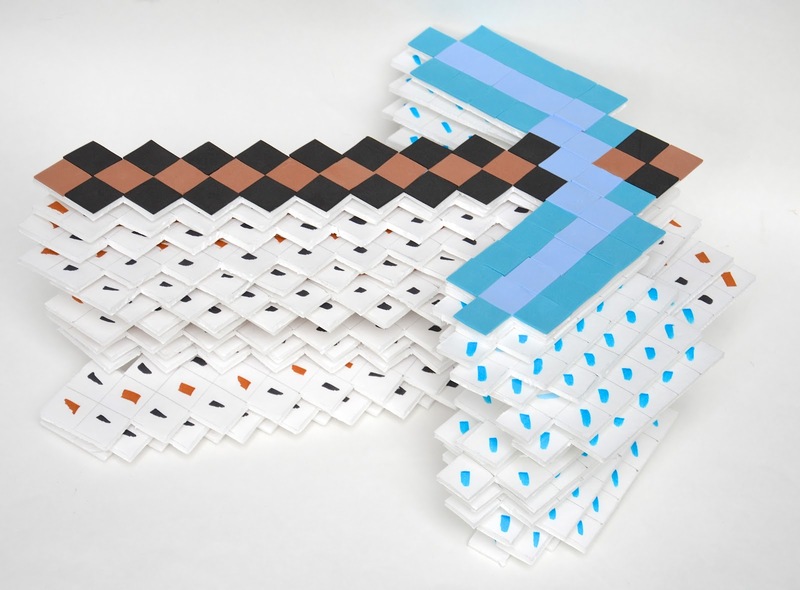 the pickaxe, having those four long straight edges, was overall easier to cut out en masse. Which might not seem like a big deal, until you consider that every other edge is jagged. 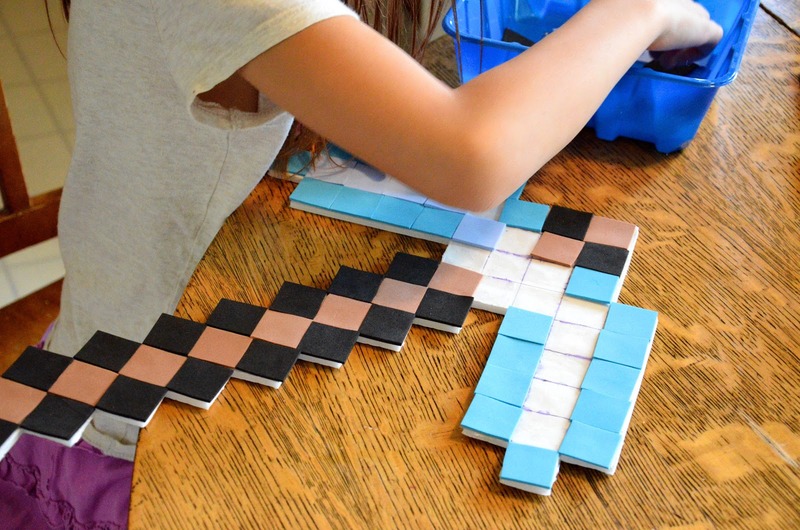 And when you multiply those by 15 pickaxes, well, I'll take more straight edges, please. And yes, each of those 15 pickaxes was cut out by hand, not Silhouette machine or diecutter or Oriental Trading Company blanks. Which is exactly as crazy as it sounds. But still not as crazy as the bunny hutches from this party. 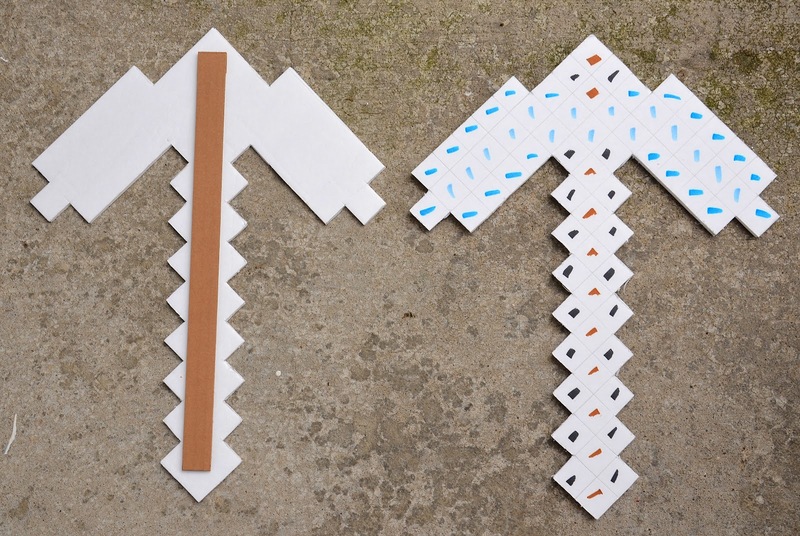 The pickaxe blanks were cut out of dollar store poster board. One board made four. So each pickaxe blank cost 25 cents. And if you oriented them cunningly enough on the board, the stepped edges fit into each other so you only cut one edge per two pickaxes - my attempt at cutting corners. Ha - bad pun. I pixelated the surface and marked each square with the color of foam tile that should go on it so that it was almost like a paint-by-numbers canvas. I almost skipped this step but decided that it would be a lot easier this way on the day of the party than to have everyone stare at a completed sample and try to copy it. On the backside, I hot-glued a cardboard spine for reinforcement. The flutes of this cardboard spine are parallel to its length, to counteract potential buckling. The foam tiles were very elusive. 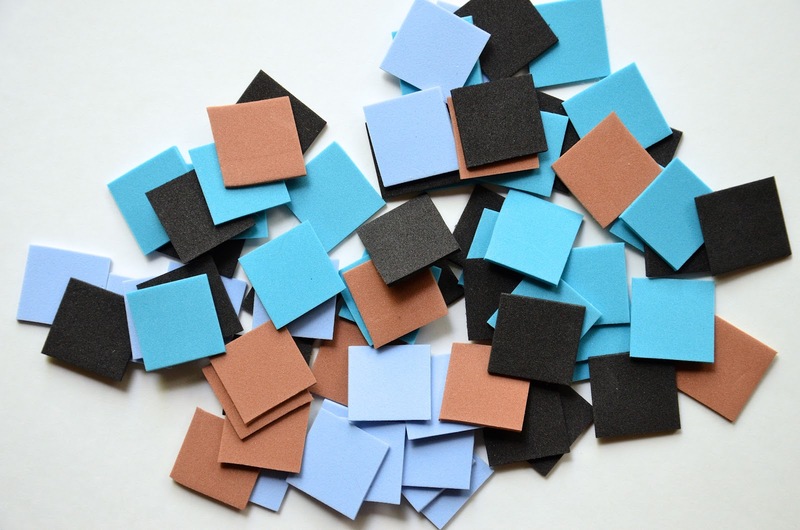 Because I was lazy, I had hoped to buy a tub of multicolored self-adhesive foam squares from Michaels and toss out the colors that were wrong (or else force everyone to make Rainbow Pickaxes). Sadly, Michaels did not have colored foam tiles, or any kind of self-adhesive square thing that would work. Neither did Oriental Trading Company. Or etsy. Or amazon. 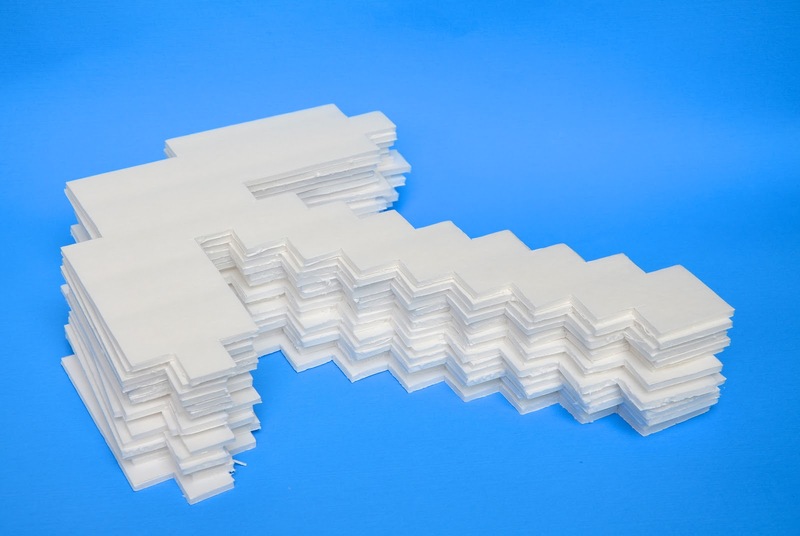 So I thought I'd buy self-adhesive foam sheets and cut them into squares. Again, zero. Either they were the wrong color, or inconsistent thicknesses, or I had to buy several expensive multipacks of unnecessary bold and pastel shades just to get what I needed. 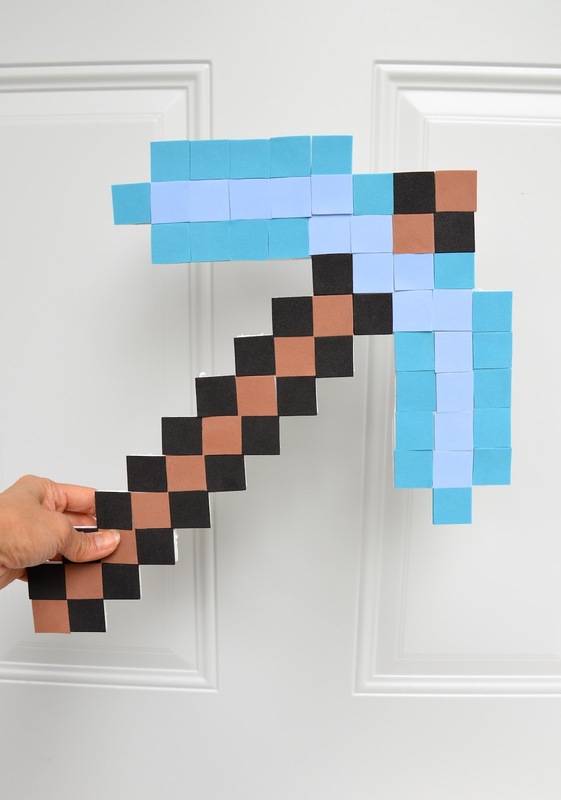 So I thought I'd use regular foam sheets and find some way to make the pickaxe itself sticky, so the kids could easily apply foam tiles to it. So we tried reverse contact paper. Here is Kate testing out Sticky Pickaxe, Take 1. It worked! 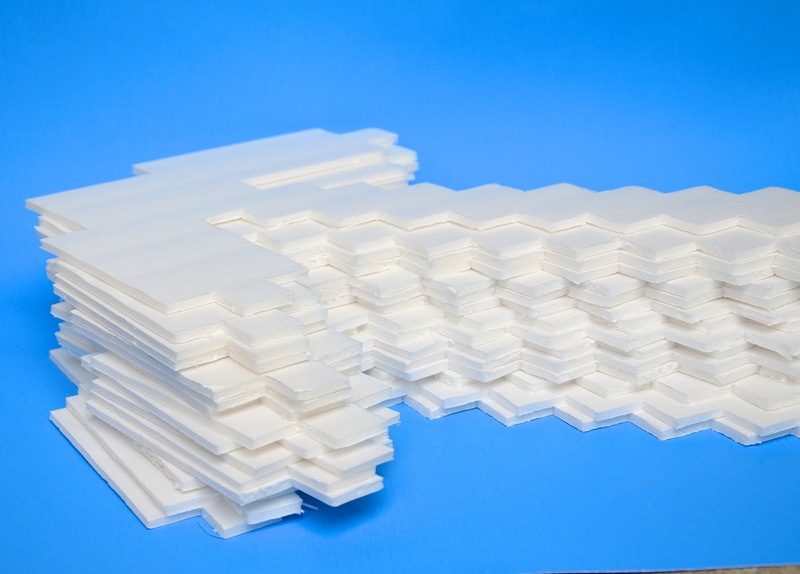 But minutes later, ALL the foam tiles fell off, followed by the reverse contact paper. Back to the drawing board we went. 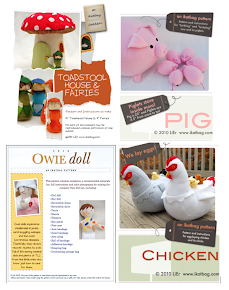 Let's fast-forward past the other silly ideas- glue dots, spray adhesive, DIY square stickers etc. to what finally worked. It was ridiculously simple. 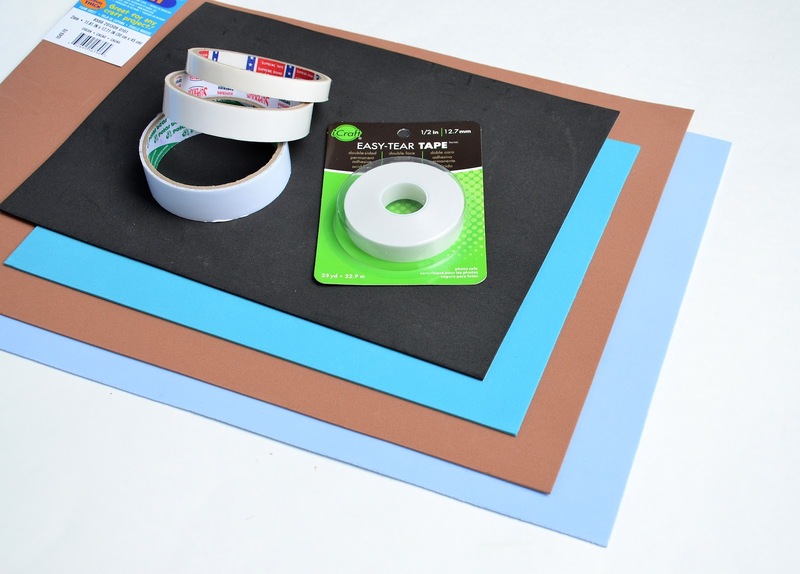 Regular 2mm craft foam sheets (less than $1 each) from JoAnn or Michaels, and double-sided scrapbooking tape (about $3+ using our 40% off coupon) from Michaels. 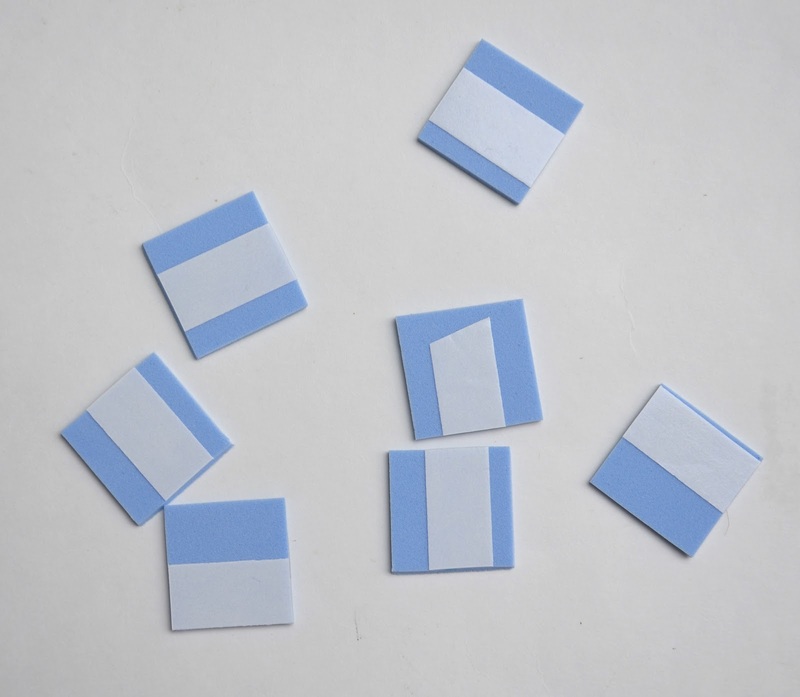 There are many kinds of double-sided tape so be sure to buy the kind that has backing paper lining. On the left of that roll of tape are three other rolls of similar tape you can buy for a song in Asia and which we have loads of in our house. They're good for paper but the one from Michaels is strong enough for foam. 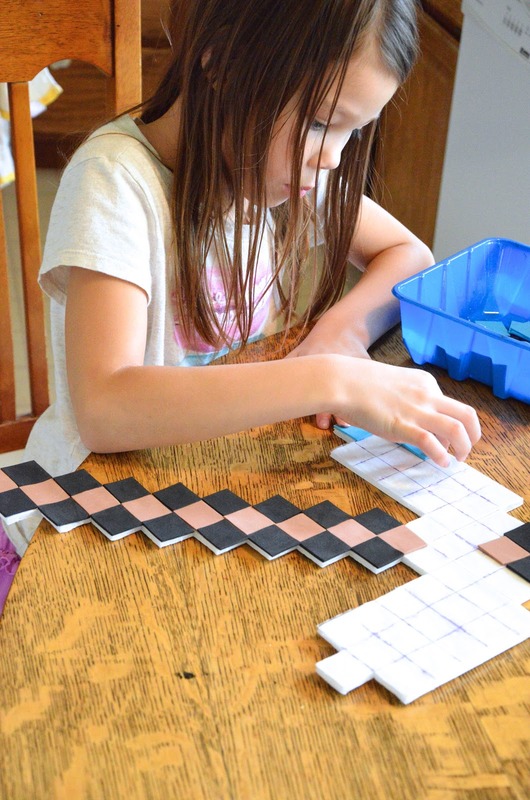 Making the self-adhesive tiles was as straightforward as cutting the foam sheets into strips (ours were 1" wide), applying a strip of tape along the entire length, then cutting each strip into 1" squares. for the kids to peel-and-stick. I love how creative you are and how much thought you put into parties for your children. 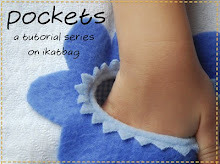 I tried this myself when my children were young, but have never been as cleverly creative as you. I have to ask, though, in my experience there is always the child that will resist the creative activities. They get "bored" coloring, "bored" gluing, "bored" doing anything that doesn't involve running and jumping. What do you do with that child? Incidentally, I put the word "bored" in quotes because it was not a word that was allowed to be used in our home. I really do like how you are teaching your children problem solving skills. Such a wonderful thing to read about. Thanks. LindaC: Do you mean a party guest who gets "bored"? We haven't had any guests like that that I remember. 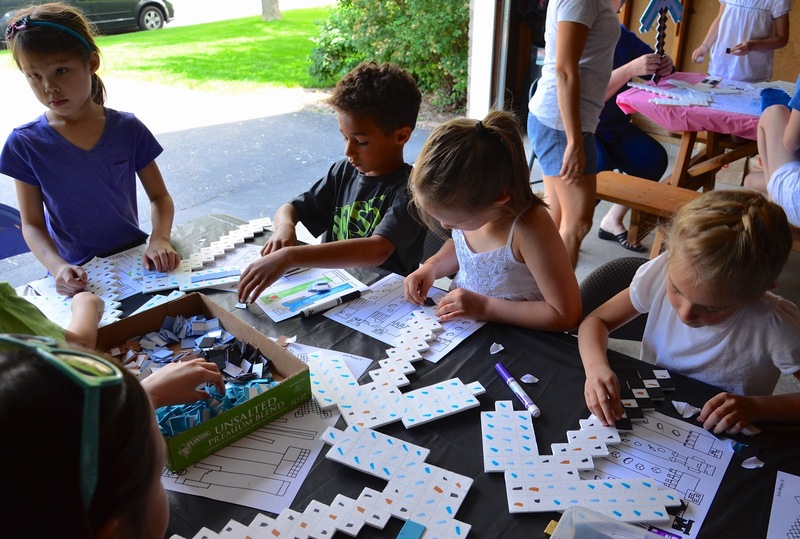 Most kids will color or do creative activities very happily, even though they are very excited about running around also, and will keep asking when they can. We direct the activities with very little lag time between events, usually - so the kids are usually herded from one thing to the next, and if there is downtime because we're waiting for the youngest guests to finish a task, the others get to run about in the yard. This is also why I like having outdoor parties - I'd go nuts with this many children indoors. That said, our biggest challenge as far as guests go is the kid who has separation issues or does not want to participate at all because she claims "doesn't know anybody" and cries and keeps clinging to me. This has only happened once or twice, and we usually ensure that we invite groups of kids who know each other, or we invite back repeat guests whom the girls have had long friendships with - this is usually the case as the girls get older and have more permanent friends. I usually have one of the my kids take care of her for a little while, or else just let her do something quiet on her own. Much as it is sad for me to watch, my job on the day itself is to run the activities, and I have to delegate the job of comforter/aide to someone else. Maybe the key is little lag time. Or maybe just the kids themselves. All different personalities. Thanks for your response. I will enjoy reading about the rest of your adventure. I am always impressed with your cutting skills. 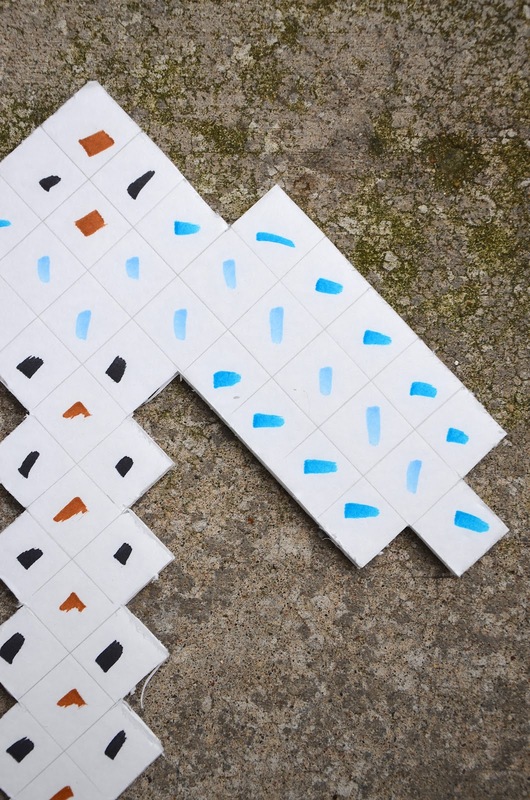 And excellent problem solving re: tiles.